I couldn’t be happier with how the kitchen turned out, and would install an Ikea cabinets again in a heartbeat (though hopefully not for many, many, MANY years). The kitchen has an awesome skylight that provides a ton of natural light and the new light fixtures throw off a lot more than the old sconces and chandelier, so I don’t even notice that we don’t have under cabinet lighting. In order to hide the cam locks and get a polished look, I had the contractor install cover panels on the bottom side of the upper cabinets — a technique that he had never seen before (and really seemed to like the result). 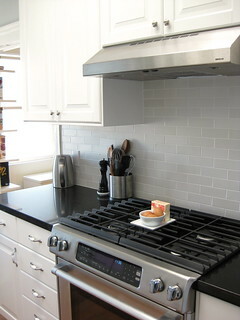 I never discussed our tile backsplash selection in my other posts because, well, it hadn’t been selected yet. 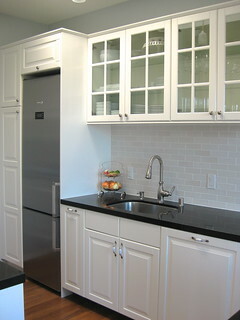 Instead of the easier-to-source 3″x6″ subway tiles, a 2″x6″ or 2″x8″ matte white(ish) tile was envisioned as the best fit for the space. Daltile was promising, particularly the Folio Two and Natural Hues, but their trim options were just not right. Thankfully, Heath Ceramics recently opened up a new shop in San Francisco with a tile showroom. There, a wide selection of colors and finishes in two- by six-inch tiles (with same size short side bullnose) were available — ultimately, the tile was ordered in a matte, stone white from their Classic Field line. Their slight color variation from tile to tile adds just the right touch of vintage feel to the kitchen, which pops even more with the 1/8″ bright white grout lines (sealed to protect and prevent staining). Since taking these photos, the only thing that I’ve changed is the paint color (I know, I know!). The original, Light French Gray from Behr, was far, far too blue (plus the adjacent living room is light yellow [Behr Parmesan], so it was a bit too pastel-y for my taste) — it really clashed where the tile and wall color met. So now it’s painted in Benjamin Moore’s Light Pewter which is a light “greige” (I like it even more than the popular Revere Pewter, which strikes me as more yellow and a shade or two darker). I love the colour palette you have used in the kitchen. Very smart to use black in all the right places. And the tiles are so beautiful! Beautiful cabinets! Thank you! The wall color definitely comes (err, came . . . it’s no longer) across more blue in person than in the photos, but I’m loving it now that it’s repainted and better complements the tile and the adjacent room :). You’re kitchen is absolutely gorgeous. 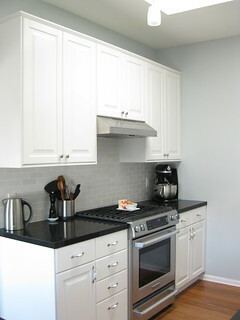 I’ve been doing my research about using IKEA as well, could I ask what cabinet doors you have used? And are they white or off-white? Thanks! Thank you, Elizabeth! I used LIDINGÖ doors (aka Lidi on some parts of the Ikea site). They are white — my camera did something funky to the glass front doors, they aren’t yellow in person! 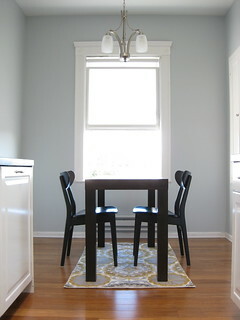 A very close color match is Benjamin Moore paint in Simply White if you want to see a swatch. I’m totally happy to answer any other questions — I really enjoy it! Thanks so much for the quick reply! It looks like Australia only stocks the Lidingo in off-white so I’ll have to use a different style of cabinet to get the white. Hopefully I can still get it looking close to yours!